Chancellor Davenport; Dean Lee; Professor Taylor and Dawn; the love of my life, Teresa; honored faculty; and, of course, the University of Tennessee Arts and Sciences Class of 2017! Class of 2017— How does that sound? How…does…that…sound? I heard something like that 60 years ago! Can you believe that? That’s going to be a journey that I certainly would like to take. Where are all the veterans or active duty military? We know we have one here on the stage. [Applause]. And I’m sure their families are here watching some of their children graduate. Thank you so much for your service. We all are grateful beyond all measure. I greatly appreciate this honor of receiving an Honorary Doctorate of Science and Humane Letters in Earth and Planetary Sciences. This occasion is particularly meaningful to me as my Mother, Ethel Hagan, was born in Giles County, Tennessee, and she was a 1927 graduate of Peabody College. First of all, the dedication and competence of engineers and skilled workers to the job of designing and building our landing spacecraft, the Lunar Module Challenger, was absolutely remarkable— beyond my experience before or since. Also, only an extremely faint possibility existed that the rocket needed to come home would not ignite. Ignition only required electrical signals to reach two pairs of redundant valves. These valves fed the injector that mixed fuel and oxidizer in the rocket’s combustion chamber. As dimethyl-hydrazine fuel and nitrous tetroxide oxidizer will ignite on contact, the Lunar Module’s ascent rocket would take us back into lunar orbit. There were several automatic and manual ways of getting these necessary electrical signals to the fuel and oxidizer valves, but the final option, once all others had failed, should be familiar to you. 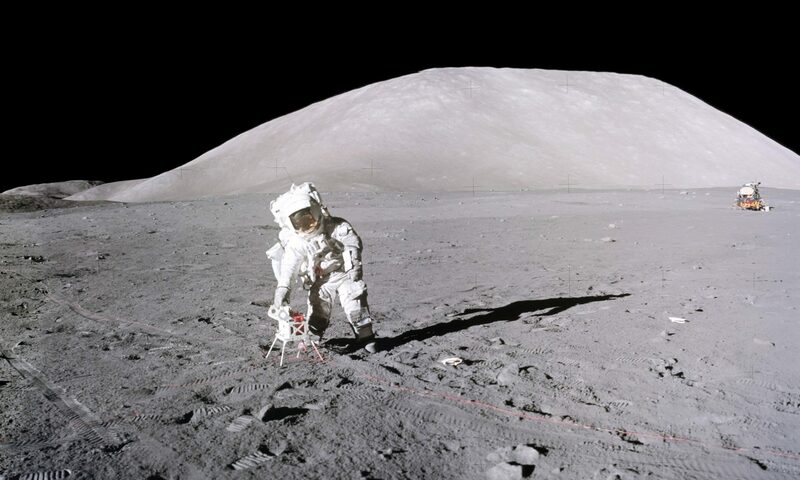 Most of you probably have in your trucks and cars what we had in the Lunar Module, namely, jumper cables. That’s right, we had a pair of jumper cables, just like I had in my ‘55 Chevy and now have in my Ford 150. In a final contingency, we would depressurize the spacecraft and I would go outside with the ends of the jumper cables. The alligator clips would be attached to the positive and negative posts on a battery in the lower section of the Lunar Module. Back in the cabin the clips on the other end of the jumper cables would be attached to two engine valve circuit breakers, hopefully after I had returned. Instantly, an electrical signal would open the fuel and oxidizer valves, and we would be on our way, cabin hatch ajar and jumper cables waving in space behind us. I, of course, hoped to be back inside in time! So, in spite of the remarkable technical and operational precision developed to meet John Kennedy’s challenge to put a man on the Moon and return him safely to Earth; and in spite of the complex backup procedures, and the 100 billion dollars, to be sure that goal was reached, it might have finally come down to using a $10 set of jumper cables. Billions of taxpayer dollars were required, the issue of war or peace was ever present, engineering issues were overcome, family sacrifices were made, and the race to the Moon was won, but it might have all boiled down to a question of having the means to solve the ultimate problem of coming home from 250,000 miles away, in this case, with a $10 set of jumper cables. Our lunar jumper cables are a reminder to always be prepared as circumstances change. Make sure you have “jumper cables” in life’s stowage compartment. Your time as a Volunteer has been only the beginning of filling your personal stowage compartment. Early Tennesseans, like the Jacksons and the Hagans, did not have the technological luxury of back-up systems, tele-communications, and mission control centers to supplement their wits. Nonetheless, they did have their wits just as you have added to yours. May wisdom and knowledge forever grow in your stowage compartment. Much has been learned along the way to the Moon and continues to be learned every day. My time with the Apollo Program, however, taught me that, when Americans do great things, we rely on young Americans. The average age of the 450,000 designers, engineers, skilled workers and scientists that enabled Neil Armstrong to be the first man on the Moon in 1969, and me to be the 12th such man, was about 25! Yes, 25 years old. Most of you are very close to that age right now. Your most productive and exciting years are just ahead of you! Pleae keep that in mind. As America moves forward toward a future on the Moon and Mars, as many thoughtful Americans think it should, it will be your generation that creates that future. It will be your generation that leads the way. I wish you the very best in these critical endeavors. At the same time, find the love of your life and your own set of jumper cables. Finally, thank you again for this great honor to join you as a UT VOLUNTEER! An 87 Mb mp4 file of the Award Presentation and Commencement Address can be viewed and/or downloaded by [clicking here]. It lasts 16.5 min. To save it directly (if the browser auto plays the file), use the browser’s “save video as…” feature by right-clicking in the video frame, or control(ctrl)-click on a MAC if the mouse has only one button. (All photos and video clip from the College of Arts & Sciences, University of Tennessee, Knoxville video production with thanks to Russ Hollingsworth, UT Video Director. Thanks also to Colin Mackellar of Sydney, Australia for editing and compressing the video file). A brief 36 sec 19 Mb mp4 video clip of the actual lift-off of the Apollo 17 Lunar Module Challenger as seen by the Lunar Rover TV camera operated remotely by Ed Fendell at the Mission Operations Control Room in Houston, TX can be viewed by [clicking here]. An excerpt of the dialog is given below. Near the beginning of the clip, Jack Schmitt starts the countdown with “99 Proceeded—3, 2, 1… Ignition”. When the hypergolic fuel and oxidizer mix together in the engine combustion chamber, ignition is automatic and the cables attaching the ascent stage of the Lunar Module to the lower descent stage are severed by a series of explosive bolts. Also, the mylar reflective insulation material covering both upper and lower stages is shredded. All of this material can be seen flying away from the spacecraft as it begins its ascent. A few seconds later both Jack Schmitt and Gene Cernan announce “pitchover”, indicating that the spacecraft is pitching forward, heading towards orbital rendezvous with the Command and Service Module, America. As the ascent stage pitches forward (into the plane of the video frame), the flames from the ascent engine can be seen as a bright orange circle in the center of the bottom of the spacecraft. As the spacecraft continues to move towards the lower left of the video frame, Cernan gives the altitude as “1500 feet” and Schmitt ends the clip with “…and H-dot looks good”. 188:01:30 Cernan: …pushed. Engine Arm is Ascent. 188:01:40 Cernan: We’re on our way, Houston! 188:01:51 Fullerton (Houston CapCom): Roger. You have good thrust. 188:01:58 Schmitt: Okay, 30 seconds; 308 is your number. 188:02:02 Cernan: Okay, coming through 1500 feet. 188:02:03 Schmitt: And H-dot looks good. AGS (pronounced “ags”) was the “Abort Guidance System”, an independent backup computer system that automatically engaged if the primary guidance system failed. H-dot is a mathematical term for instantaneous velocity of the spacecraft (time derivative of altitude or height). (Text is an excerpt from the Apollo Lunar Surface Journal. Times denoted in bold on each line are Ground Elapsed Time since launch + 2 hrs 40 min. The latter time is a launch delay that was added to the planned launch time so that time entries on printed checklists and other planning media would not have to be changed. The transcripts of all 6 Apollo landed missions are available at the ALSJ website. The video clip was provided by Kipp Teague on his website ).